Today, businesses have valuable operations data spread across multiple content management systems. To help discover, manage, and deliver this content, IBM® provides IBM Content Federation Services and IBM Content Integrator. 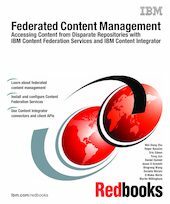 This IBM Redbooks® publication introduces the concept of federated content management and describes the installation, configuration, and implementation of these product offerings. IBM Content Federation Services, available through IBM FileNet Content Manager, is a suite of three federated content management services based on the federation implementation strategy. We describe how to install and configure Content Federation Services for Image Services, Content Manager OnDemand, and IBM Content Integrator. Using an integration implementation strategy, IBM Content Integrator provides a repository neutral API that allows bidirectional, real-time access to a multitude of disparate content management system installations. We present connector configuration details to frequently encountered content management systems. We provide detailed instruction and sample implementations using the product's Java™ and Web Services APIs to access content stored in repository systems. This book is intended for IT architects and specialists interested in understanding federated content management and is a hands-on technical guide for IT specialists to configure and implement federated content management solutions.